Tixs for Kids can be reached at (505) ANY-TIME (269-8463), or via e-mail through John Aragon. As a nonprofit organization, Tixs for Kids relies solely on donations from individuals and businesses. A donation can come in many forms, such as an unused ticket, any monetary amount that can be used to purchase tickets to an upcoming event, or simply donating your time and services. For example, even though the kids have a donated ticket to an event, they still need transportation to and from that event. As an added benefit, your donation is tax deductible. Tixs for Kids is a nonprofit organization made up of volunteers and caring businesses that send kids with disadvantages to events and places they may not be able to afford. Because of the high cost of living and medical care, little is left over for the kids to just have fun. Donated tickets for events such as concerts, sporting events, the zoo, and amusement parks are used to brighten the life of a child in need. Everyone involved with Tixs for Kids is a volunteer. All tickets and donations go directly to the kids--there are no paid employees, administration fees, or other costs. John Aragon, founder of Tixs for Kids, has pledged to personally pay 100% of all administrative costs. Catch Tixs for Kids in action! And here's a playlist of more videos. Tixs for Kids, Eagle 98 and Wal-Mart joined forces to raise school supplies for kids whose parents couldn't afford them. These supplies went to Lowell Elementary, Eugene Field Elementary, John Adams Middle School, and Old Town Elementary Schools. School supplies also were given to kids evacuated from the Katrina disaster who are going to school locally. 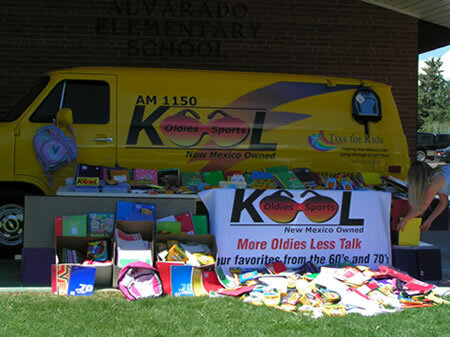 Kids from Alvarado Elementary helped us sort through the many school supplies that were donated. There is nothing more precious than Kids helping Kids! Tixs for Kids has come a long way in a short time. It continues to amaze me how many kids there are that are going through hard times. Whether it's physical, emotional, or financial reasons there are many kids that could use something happy to smile about in their life. With your help we will continue to do whatever we can for these kids. Eagle 98, Radio Free David and Southwest Cyberport are proud to host Tixs for Kids.